There are various kinds of eggplant ("makua") grown in Thailand. We are pleased to offer fresh Thai eggplant known as "makua pot" in Thai language. 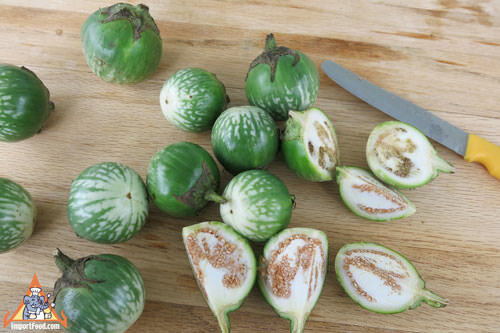 Grown in California, each eggplant is about the size of a golf ball, appearance as per photograph below. These are perhaps the most common eggplants found in Thai markets. It's eaten as a fresh vegetable with various kinds of namprik (any flavor). Each fruit has small brown seeds in the core, and those seeds are used to make namprik kapi. This type of Thai eggplant is also used in all kinds of Thai curry, as well as kaeng par -- simply cut into quarters and add to the dish. You get 16 ounces, and has about 20 eggplants. We ship fresh Thai eggplants via Priority Mail, quick delivery within 2-3 days straight to your mailbox. They are packaged well and should be refrigerated promptly, and will remain fresh for about 5-7 days. Please Note: if you order only fresh produce, select "$0.00" as shipping charge at checkout (because the prices below include shipping). If you order fresh Thai eggplant and any other non-fresh items, you must checkout with "Fedex Ground" as the shipping method, and you will receive the other items separately. We also offer Baby Eggplant, packed in brine. And more from our Recipe Collection!